I'm probably the last person on the face of the beauty blogosphere to do one of these posts - but the beginning of this year has been crazy already and the semester has already started! I'm going to be honest - I've only used one primer all year long. 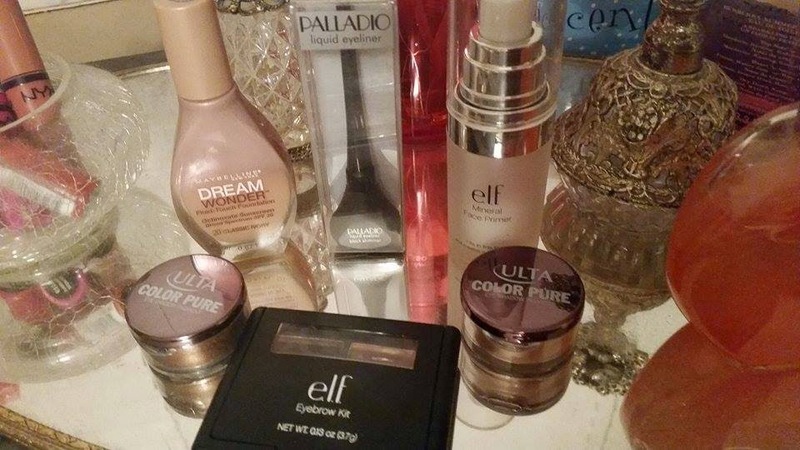 The elf Mineral Infused face primer - and I've had to repurchase it a few times. New year - new primer. I'm currently trying out Benefit Porefessional. But I'm a little worried about it breaking me out. Maybelline Dream Wonder Fluid Foundation. This foundation is so light, so easy to apply, and feels like a dream (haha) on my face. It also comes in a ton of shades and matches my skin tone wonderfully. I love the Ulta Loose Powder shadows. I own them in 3 different colors and I'm loving them in Mesa and Sienna. Yes, two shades of nudes. But lets be real, they are gorgeous, affordable, easily blendable, and pigmented like crazy! They make getting ready in the morning so easy. I've tried so many different liquid liners this year - and I keep going back to the same one. Palladio Liquid Liner in Black. I don't know what it is about this liner, I love the formulation and the color. It never dries too fast or too slow - and it doesn't strip if I need to go over it. Its amazing for a simple wing and I have already repurchased it for when the current one I'm using finally dies. This year I've been loving the Naked Palette from Urban Decay. I feel like I've been using a lot more neutrals this year and staying away from different colors other than shades of nudes. This is probably because I'm wearing most of my makeup to work - and god forbid if I come in with a colorful eyeshadow because my office manager just cannot even. I've been loving the Ardell lashes in Natural. They really do look natural with my tric and when I really feel like glamming it up they are the perfect addition. Okay so, I have more Nyx butter glosses than shown in the picture. The ones currently not pictured are residing within my purse(s)! But other than that, I've been in love with the Nyx butter glosses and matte lip sticks. They come in a wide and amazing range of colors from everyday colors to some pretty awesome night colors. It was been a rough year for my skin - and I'm getting a lot better about removing my makeup and properly washing my face in both the morning and afternoon. For the morning I like the Clean & Clear Morning Burst facial scrub. With that I like to use the Clean & Clear Night Relaxing Deep Cleansing face wash. 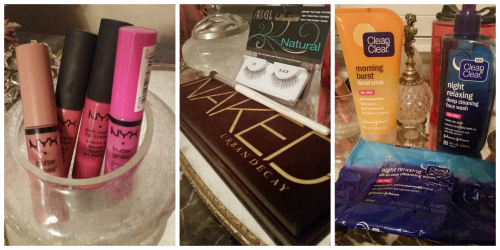 I have and use the makeup remover towels regularly as well. (Pictured is actually my second repurchase) I love the night wash because whatever is in it really winds me down at the end of a crazy day and helps me relax.